Carlos Rafael Rivera is a commissioned and award winning composer whose career has spanned several genres of the music industry. His soundtrack for Universal Pictures’ A WALK AMONG THE TOMBSTONES, starring Liam Neeson and directed by Scott Frank, is now available through Varèse-Sarabande Records. A protégé of Randy Newman, he earned a DMA in Composition at USC’s Thornton School, where he studied with Donald Crockett and Stephen Hartke. Equally comfortable in popular music, he has performed onstage as opening act for The Who at the Hollywood Bowl, while his guitar work includes performances on feature soundtracks (Crash, Dragonfly); studio sessions for Island/Def Jam, and Universal Records; as well as ABC’s Scrubs, MTV, and VH-1. His music has been acclaimed by the Miami Herald, the San Francisco Examiner, and the LA Times, helping establish him as a composer with the unique ability of incorporating a large diversity of musical influences into his captivating compositions, which reflect his multi-cultural upbringing in Central America and the United States. His work has been performed by some of the most prominent ensembles and soloists, including Arturo Sandoval, Colin Currie, Chanticleer, Cavatina Duo, the American Composers Orchestra (ACO), the New England Philharmonic, and the Los Angeles Guitar Quartet (LAGQ); commissioned by the Simon Bolivar Youth Symphony, the Miami Symphony Orchestra, and the American Wind Symphony; recorded by Warner, Sony, Naxos, and Cedille labels; published by Mel-Bay, and Doberman Editions; and awarded by the ACO, the Herb Alpert Foundation, the Guitar Foundation of America, BMI, and twice by ASCAP. He has served as Composer-in-Residence with the Miami Symphony Orchestra, as well as musical consultant for “Invitation to World Literature,” an educational series funded by the Annenberg Foundation and produced by WGBH. 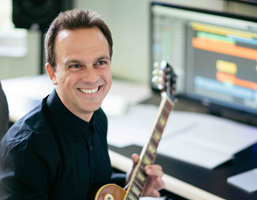 He is a voting member of the Recording Academy (Grammy’s), the Society of Composers and Lyricists (SCL), and is a sought out guest composer and lecturer throughout the US, as well as a faculty member at the University of Miami’s Frost School of Music. Carlos has recently signed with Amos Newman at William Morris Endeavor Entertainment (WME) – whose clients include Hans Zimmer, Trent Reznor, and Ennio Morricone.